Many proverbs and expressions are derived from local cultures, others are more general. Greetings more often than not are common all around the world and in any language. • "Light with you" is the most common greeting for meeting and parting. Light is an important part of spirituality as the symbol of the Great Spirit itself, and is used in many sayings. • "Safe ways" are wished on respected people leaving and is hardly ever said as a mere ritual, but the speaker either means it, or omits saying it altogether. • "Guard of the Four" is a shortened greeting when parting, to grant the leaving party the protection of the Four, the greatest force of order, who have also been known to happen upon travellers who're lost or in trouble. • "Silence!" is hardly a standard greeting, but is used among those who think being a speaker is bad. The voiceless are the counterpart to the speakers, and thus, keeping the silence will keep it that way. "The older natives spoke almost entirely in proverbs and were so hard to understand even our polyglot friend Mianrat scratched his head in puzzlement. Fortunately the younger people spoke quite regularly, even though their elders frowned at their lack of finesse. Or so we think they said." • "By the Great Spirit", "in the Spirit's name", or "by all the spirits" are called out in shock or awe. With large protective nature spirits around, they may be called on instead; flourishes include attributes of those spirits like "by the eternity of the Spirit", or "by Molmorur's mumble". • "Dalgango" is an insult. 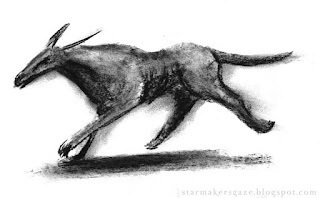 Dalgangos are pack animals that are considered dirty, mean, and stupid. • "Iskilanian" describes most honourable fulfillment of duty, even in danger to oneself. It goes back to the message runner Iskilan, who crossed the frozen sea to deliver the letter preventing a war between two countries. • "Kmalian teapot" is a thing that is superfluous, gets way too much attention, or is suspected to be useless altogether. • "black-handed accuser" refers to the custom on Accusation holiday (17th day of Judgment). Everyone's sorrows are heard, but every grievance requires one finger to be blackened, and so a black-handed accuser is one who is never happy. "My friend claims that nature spirits have proverbs too, but hasn't found what they refere to. He thinks its the Great Spirit; the larger spirits have also been found to quote former Four, which took quite some historical research and a bunch of wrinkly elves, but it seems true." A world of fun, inventing proverbs. One standard expression may come from sounding awesome, and then it needs a cultural background, and then I have new historical events. Some were harder to translate from German and have been left out for now, like "magisch" and "zauberhaft", referring to the mages or wizards, respectively. Most animals of the blue forest strike the traveller as odd, but lessevehnes have made some think they inadvertently landed in the Area. Lessevehnes have incredibly long legs and necks, and flexible antlers, with which they gather fruit, and make noise as well. The water-blue fur is so soft it can barely be felt. Always do they look as if the wind could take them away, and they never run, only walk. Lessevehnes are not hunted, but their antlers are used for a special musical instrument in the blue forest. "The bard played wonderfully on her instrument, but when we met a living lessevehn weeks later in the forest, and heard what it could do with its antlers - the bard's skill really paled to insignificance." I painted a creepy giant beast ages ago for a surreal card game, and the basic idea stuck with me until I could make it work for these beasties. It's fun to make animals stick to the general impression of the single coloured forests. Northern Gdera is where Frullahan lies, between polar Chasland, Elnarland, Dannamar, Omarhan, and small Nalwar, and southern neighbour of cursed Grandrock. Politically, it's unimportant but influential at the same time - there are few alliances and trade partners, but the baseless, twitchy actions of Frullahan puzzle the neighbours frequently and have them take action. A long-dead mage king had led numerous campaigns to conquer surrounding territory, which leads to conflict to this day; since Frullahan makes no gestures of giving back any of it. "Many have suspected the king sought for the Deep Archive in the expansions, but scouring the conquered lands hasn't turned it up either. Others think the Archive always belonged to the Frulla, and the contents made him take so much land." 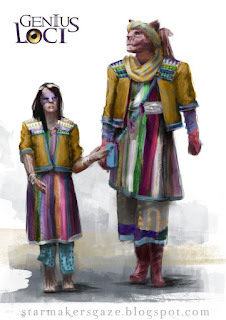 The Frulla - the country's largest tribe - are liberal and carefree, but laborious and perfectionistic, and often compared to goldfairies because of it. Their traditional attire supports the assumption that they're not quite right in the head; Frullahanians carelessly throw together colours, adding foreign patterns and accessoires in no apparent order. Typical are the belted long shirt with vertical stripes in various widths, and the jacket with shoulders quilted from triangular pieces. 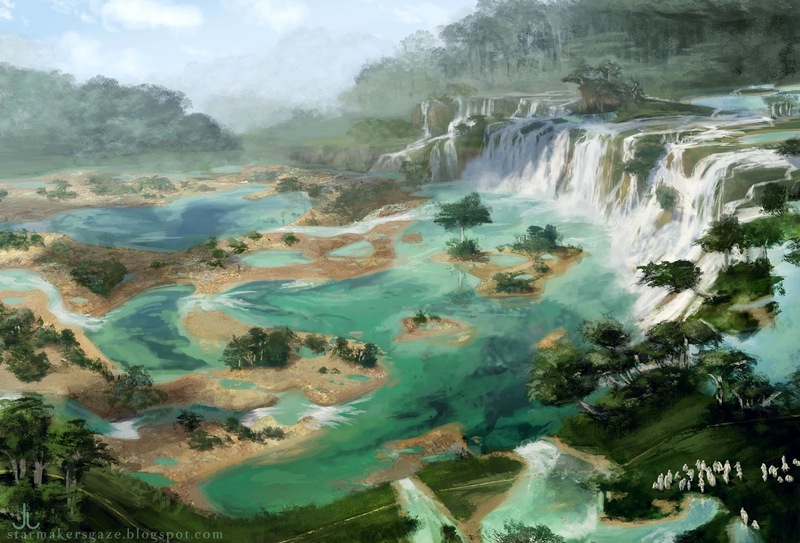 Frullahan is known among historians and treasure-hunters as the home of the Deep Archive. What it contains is wildly debated and sprung many legends; it is said to be guarded by a fleeter, and while many thieves, robbers, and adventurers have tried to find it, none succeeded. "Yeah, the capital has been restructured again. We voted on it, but less than half wanted to cover the river, so we built the aqueduct instead and use it for traffic now; but there's already debate if more towers wouldn't be better. With bells." These wonderful countries of which you've hardly ever heard, but that turn out to pretty exciting. With people that barely make sense at first, and secretive rationales to their actions. Frullahan, as so many countries, has more to offer than I admitted to here, so let's see where telling the Genius Loci story takes us. A golbehl ist a Gderan animal that feels so unloved it's become a proverb. Golbehls are slender, long-legged animals with grey fur and red ears, the markings in the whiskered face make it always look sad. Golbehls quickly approach humans to become friends, but are so easily startled and so emotionally fragile that they just as quickly leave their would-be masters; only to try again with someone else days later. Only in the ninth year of being a pet do golbehls quite suddely evolve into loving, perceptive, and hard-working companions. 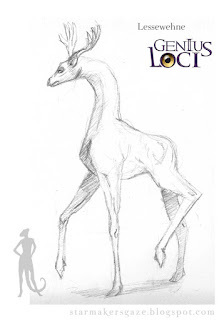 Then they have unmatched qualities as guards, are smart and quick on the uptake, and can learn surprising tricks. Always do they need much love and appreciation. 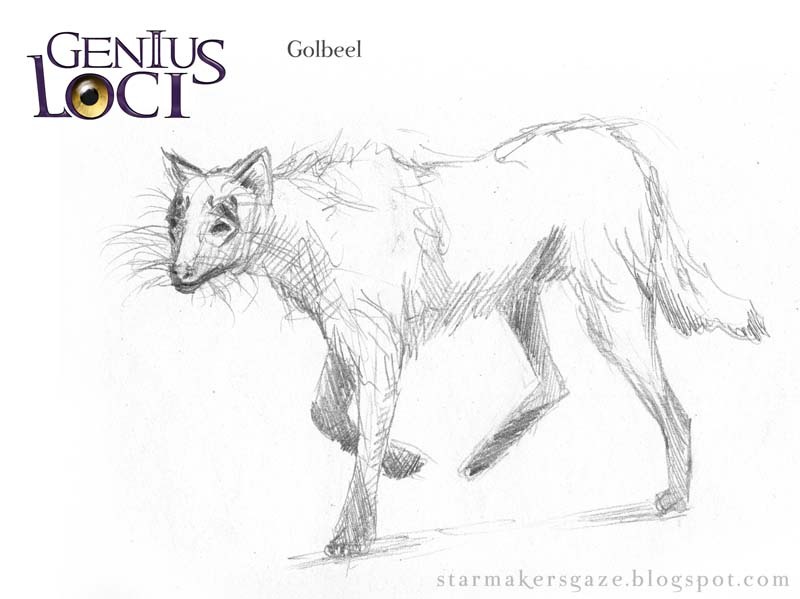 Golbehls are only kept by few, envied trainers, but many try training a golbehl. 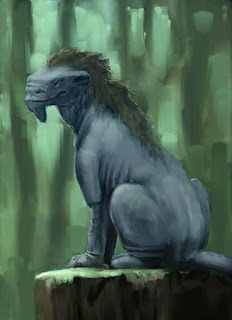 Golbehls live in the lesser green forest and can become fourty years old in the wilderness, and much older in captivity. "Golbehls are so hard to train it's always a suprise seeing somebody with one, and I've met them as companions of people from adolescents to elders and soldiers to housekeepers. Even the romantic raganaj have no advantage in training them; but a surprising amount of brownforesters are accompanied by golbehls." I've been typing 'til my fingers bled inventing animals and plants for all regions lately, and now it's high time to sketch some and make them public. Simple sketches will have to do for many, however. The Waters of Lurekin are an assembly of waterfalls, ponds, and rivers in Gderet. The delta is beautiful on its own, but the waters are also a place of power with some fame in the region. Numerous old battlefields in the vicinity mean lots of spirit collectors, who come here to cleanse themselves of the spirits trapped within them. Also, fleeters seem to have a liking for the spot and can often be met in and around the waters. "By all rights the Waters should be within Nalsiir's borders. It's unfair they put down their oversized weight to rob us of our rights to possess such an important place. One day they'll learn they can't treat us this way." The waters are a famous place to make the voiceless into speakers, granting formerly ordinary people the power to cast spells by channeling the Fifth Power. There is also a fairly large hall of voices here that manages to remain almost entirely invisible to the visitors unless actively sought, even if the place is teeming with listeners who also accompany the visitors to dangerous tasks if necessary. "Lurekin is a fascinating name. It's the name of a nearby city that now lies in ruins; three speakers of the name are known, but only two came through here; finally, there's an artifact called Lurekin's cap, which isn't a hat at all." That mages aren't only born but can also be made is one of my most important decisions about Genius Loci, I think. It's also nice for the artistic side because, naturally, places where such a change can be accomplished will be mysterious, legendary, remarkable in many ways and therefore, fun to paint. Most people know their house medicine against everyday sicknesses and small injuries. 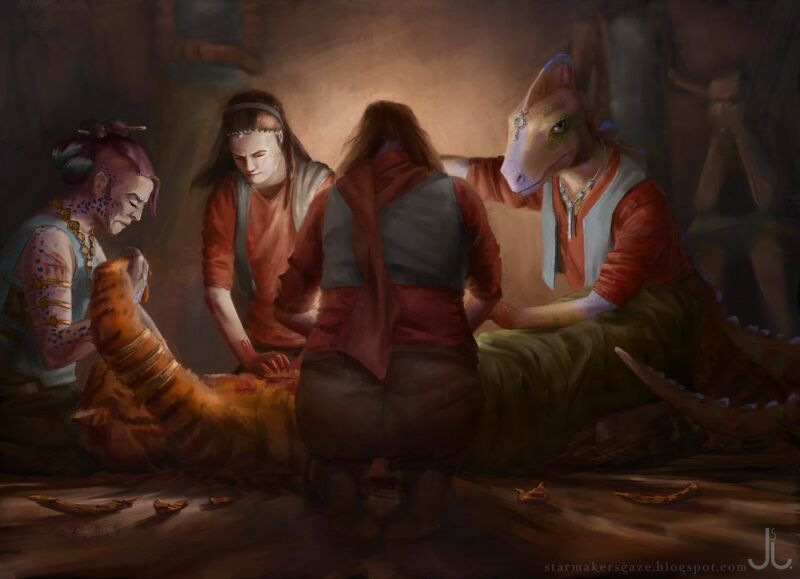 For anything beyond, apothecaries provide sophisticated healing aids, and larger cities at the least have proper hospitals with surgeons and therapists. Dwarves with their delicate hands make great surgeons, and speakers come to all medical professions and exact their obsessive ways to become experts in their fields. The red forest provides poisons which, in proper dosage, are medicinally useful, and there is barely a sickness for which a cure cannot be found in there; but it's difficult to travel, and many cures still await their discovery. "I was astonished when they brought me a redforester - a sick redforester? I couldn't find what was wrong with her until a desperate attempt, following a seemingly outlandish theory, revealed the cure to be tsemakar venom and the matching antidote. Apparently, redforesters need to be poisoned daily to be well." Elves are proverbially "more different than others", and display a range of differing reactions to normal medicine. 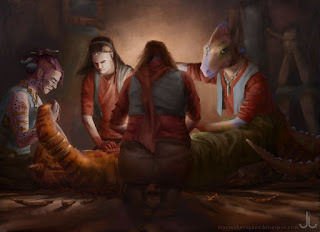 But in the end, every species has its preferences; garren show better healing when the medicine is applied hot, raganaj when it's based on animals, both as well as dwarves show in their colouring when they're not well. Most sicknesses affect all species, if not always with the same symptoms; bluefinger disease, for example, does the same to everyone, while only shankeh can get straipiness, and only humans suffer from the cold (which is a source of amusement to other species - stand them in cold water, they get sick. Hilarious.). "My shankeh patients would have needed rest to heal properly, but their need to run always drove them out of bed and their condition worsened. So I finally, if arguably, turned to the practice of either putting a nail into the knee, or breaking the leg altogether." There's always this chance when building a world that you either make it a hellhole where everything's dangerous and rotten, or way too nice because every problem has been solved, so I design diseases and poisons carefully (and civil wars, insanity, and tyrannies). The red forest may well treat everything there is from cancer to the common cold, but finding anything is bloody difficult. Literally. It's fun to come up how elves react differently to things, and define the miniscule differences between species' physiology, seen from a medic's perspective. There are of course lists of these, but I won't bore you with them. The recently posted Standing Stones of Vrebin (see the article here) are now on dA as well, as are a concept of the red forest - ever so delightful to plan a poisonous forest - and the fierce burrmo (who also already made an appearance here). 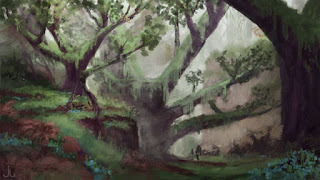 And last but not least, a repaint of the Watching Tree, an older image showing the Area. Perhaps one of the most dreaded people alive, Queen Dil-tona rules in western Lozir. She is known for her elaborate curses. The issue with that is, of course, that curses fall back on the curser to some degree, and the sheer amount of curses muttered by the queen is enough to make anyone else snap. That she still seems more or less sane is puzzling to experts of the field. 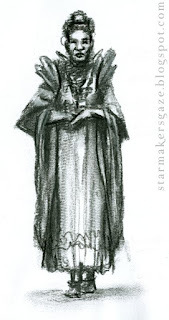 It is unknown from whence she came, and even how exactly she came by the throne is forgotten, although most genealogists agree she wasn't a child of the former king. They say Dil-tona is a Dohl Churon, which might account for her great supernatural powers. "My aunt came from only the outer fringes of Dil-tona's realm, and still was caught up in a curse that made her lose words all the time, and that took almost a year to get rid of. She hasn't set foot in Lozir since." 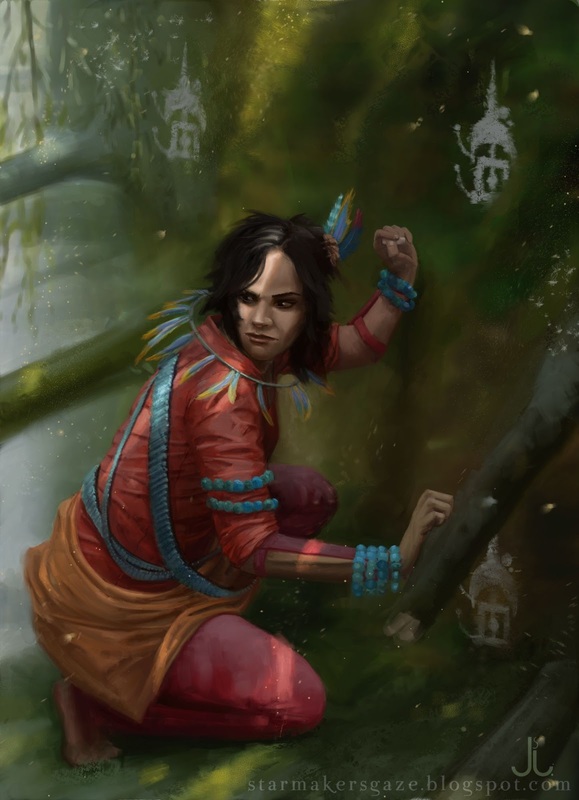 The realm of Dil-tona is not closed to outsiders but few travel there, and few natives leave - not all the neighbouring lands accept them either, because they're afraid of what the refugees might carry. 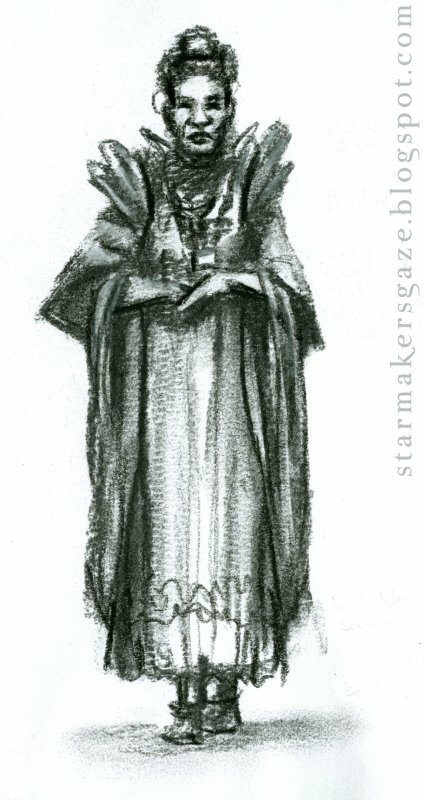 Curse-carrying is unusual and difficult, but the queen masters even that almost effortlessly, feeding the fears. Nevertheless, the queen is beautiful, and as love goes, some men with heart feel they could save the queen - or the land - by softening Dil-tona. None have succeeded, and by now the row of wooers' graves is almost longer than the line of the wooers themselves. "Who knows how many of the curses of the Empty Lands trace back to the Lonely Queen. One can only hope the stories about her finding love and being cured by it are true, and that someone endures to give it to her." Creepy rulers, cursed somehow, who can only be swayed by true love, or the famous true love's kiss, is a classic in fairy-tales, and as such has of course found its way into Genius Loci. I won't tell if that can actually turn Dil-tona from a bloodthirsty lunatic into a lovable woman. But it would be nice if being loved could do anything, wouldn't it? The sketch is a design sketch, and I'm not set on it yet. Making an atmospheric illustration for Dil-Tona is of course mandatory, but it'll have to wait since it's been so long since my last article here.